Born in Detroit in 1945, Harvey "The Snake" Mandel is an excellent guitar player who began his career in 1964 on the Chicago Blues scene, playing on records and performing with Charlie Musselwhite, Barry Goldberg (he played on his first five albums) and Neil Merryweather. Playing in a very recognizable fluid style and specialized in sustain and controlled feedback, Mandel began his solo career in 1968 with Cristo Redentor. Housed in a stunning sleeve signed by Alton Kelley (of Mouse & Kelley), this largely instrumental album was produced by Abe "Voco" Kesh and contains a good cover of Wade In The Water (also recorded by Clover). Having relocated in Los Angeles, Mandel began to do some session work, notably with Graham Bond on his Pulsar albums produced by Wayne Talbert and with Jimmy Witherspoon. After Righteous, Mandel teamed up with Russell DaShiell (Crowfoot) to release Games Guitars Play, which is probably his best album with strong guitars on Dry Your Eyes or Leavin Trunk. Mandel then replaced Henry Vestine in Canned Heat and played on Future Blues and Historical Figures And Ancient Heads. He also performed with them at Woodstock. Mandel then joined John Mayall for three albums (from Back To The Roots to The Turning Point). He moved to Janus for whom he recorded four further albums, which are not as good as his Philips period but which still contain some interesting guitar parts (notably on Shangrenade). In 1972 he also produced and organized the bluesy project Get Off In Chicago with Ken Little and Freddy Fox. He then formed Pure Food and Drug Act with Sugarcane Harris, Paul Lagos and Larry Taylor. They released Choice Cuts in 1972 on Epic but the same line-up also worked on two Sugarcane Harris albums. Mandel was also briefly part of The Ventures and even recorded an album with them! 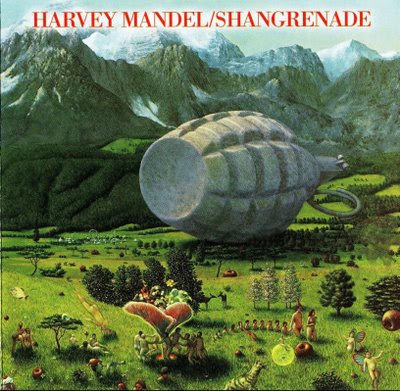 In 1973, Harvey Mandel produced both Ken Little's Solo album and a Freddy Roulette LP. He played on the Music From Free Creek project and on Dewey Terry's Big Chief. 1974 saw him playing with the Rolling Stones on Black And Blue (he was one of the possible substitutes for Mick Taylor). In the mid-70s, he vanished from the music scene but returned in the '90s and is still recording with Howard Wales (ex A.B. Shky and Barry Goldberg).